In June 2016, Fawn Weaver was in Singapore, browsing an international edition of The New York Times, when a headline caught her eye: "Jack Daniel embraces a hidden ingredient: Help from a slave." The story was written by Clay Risen, who had originally been tipped off to the story by a press person from the brand's parent company, looking to generate coverage around the 150th anniversary of Jack Daniel's. Risen, who grew up in Tennessee and had recently authored a book called American Whiskey, Bourbon & Rye: A Guide to the Nation's Favorite Spirit, realized that, at some point in his research, he had read that a slave was involved in Jack Daniel's founding—but there hadn't been much more detail to the story than that. "It wasn't a secret," Risen told Gastropod, "but it wasn't something that people talked about in any real way." Risen was intrigued, and so he traveled to Lynchburg and wrote an article for The New York Times, tying what little was known about Nearest Green to the larger erasure of the role of enslaved people in American whiskey-making. "I could sort of sketch the outlines," he told us—but he felt like there was more to the story than he had been able to uncover. In the article, he wrote that "Nearis [sic] Green’s story—built on oral history and the thinnest of archival trails—may never be definitively proved." Fawn Weaver, however, took those words as a challenge. After reading Risen's story, Weaver decided to dedicate the next two years to filling in those outlines and finding that definitive proof. "For me, as an African-American, it was mind-boggling," she said. "We know that African-Americans have been involved in so many brands over the centuries but we've never been able to pinpoint to one and say: This person actually had a name and this person had a significant role." 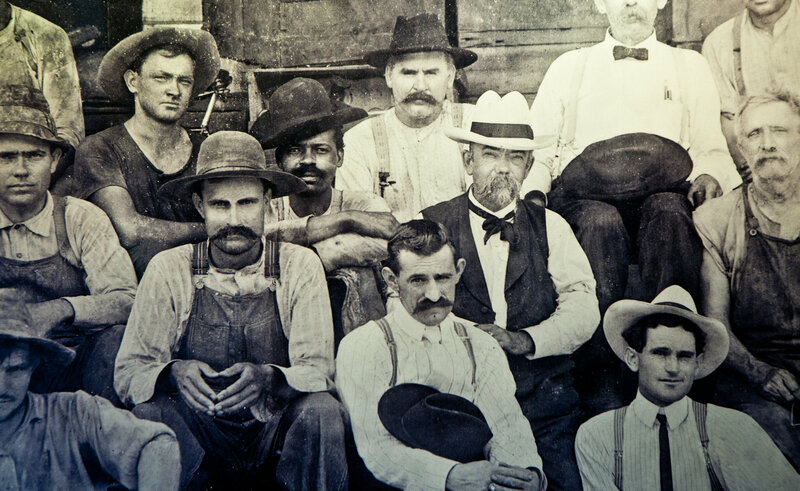 This photo from the late 1800s—one of just a handful that show Jack Daniel (with a mustache, necktie, and white hat)—also shows Nearest Green's son, sitting at his right-hand side. This episode, we follow Weaver as she tracks down Green's descendants and pieces together the true story of his relationship with Jack Daniel. Ultimately, her research reveals that Nearest Green not only taught Jack Daniel how to make whiskey, but was, in fact, the first master distiller for Jack Daniel's Distillery, and thus also the first African-American master distiller on record in the United States. But how did Green get written out of history? And what was his role in shaping the unique flavor of Tennessee whiskey? Listen in now to hear this long-forgotten story that lies at the heart of one of America's most iconic brands. Fawn Weaver is an entrepreneur, investor, author, and co-founder of the Nearest Green Foundation. You can read more about her research and the projects she is undertaking to honor Nearest Green's memory and legacy here. She is also working on a book and movie about the life of Nearest Green, and you can find links to stores that stock her multiple-award-winning Uncle Nearest Whiskey here. Clay Risen is the deputy op-ed editor at The New York Times and the author of two books on whiskey, American Whiskey, Bourbon & Rye: A Guide to the Nation's Favorite Spirit, and Single Malt Whisky: A Guide to the Whiskies of Scotland. In 2017, he highlighted Fawn Weaver's research in a follow-up to his original New York Times article, titled "When Jack Daniel’s Failed to Honor a Slave, an Author Rewrote History." Gastropod's fairy godmother! Find out more, including how to apply, here.